The Himalayan Mountains are a seam on our world, marking a place where continental plates are slamming into a new land. But they're more than that: they also mark the boundary between different climates. That is made explicitly clear in this false-colour satellite image. Taken on February 20, 2009 by the European Space Agency's Envisat satellite, this false-colour satellite image exposes the relative health of vegetation in the different climactic zones. The Himalayas are cloud catchers, leaving the inland plateau in a rain shadow. 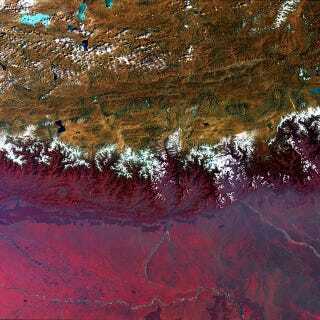 Stressed vegetation in the Tibetan Plateau is a sickly yellow, while lush, green vegetation in the plains of Nepal, Buthan, and India are a bright, deep red. The spacial resolution is 1 pixel for 300 meters.